Last Spring on a Sunday afternoon we took one of our "nowhere" drives thru the country. My husband was quietly driving along some back roads. I was occupied in the front passenger seat watching out the window as the scenery went by. I noticed out of the corner of my eye that my husband was straining to look out my window. This startled me, since his eyes should be on the road in front of him. I asked him what he was looking at out the windows, and he quietly replied, "Nothing. " He could have said he was looking for pine tree crosses for Easter. His eyes went back to the road in front of him. After a few minutes, I looked over at my husband and noticed a tear running down his cheek. I asked him what was wrong. This time he told me, "I was just thinking about Pop and a story he had once told me." Of course, because it had to do with his Pop I wanted to know the story, so I asked him to share Pop's story with me. He said, "When I was about 8 years old, Pop and I were out fishing and that's when he told me that the pine trees know when it is Easter. "I had no idea what he meant by that, so I pressed him for more information. He continued on... "The Pine trees start their new growth in the weeks before Easter -- if you look at the tops of the Pine trees a week before Easter, you will see the yellow shoots. 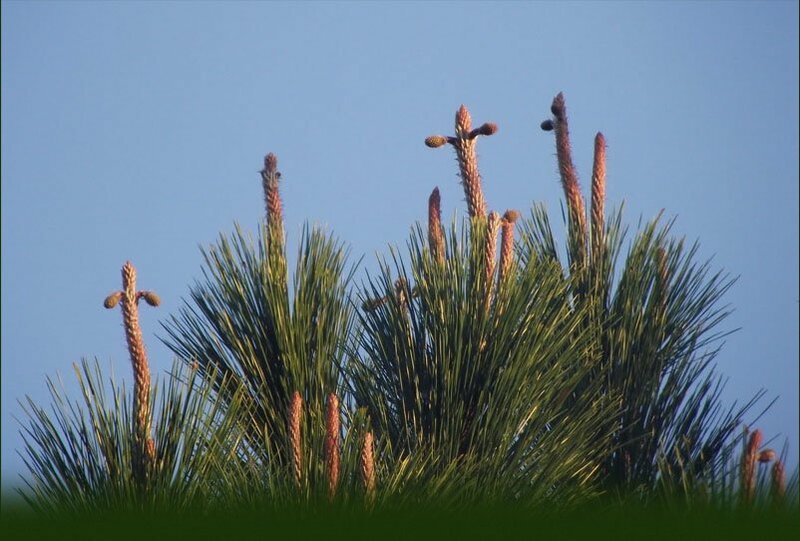 As the days get closer to Easter Sunday, the tallest shoot will branch off and form pine tree crosses for Easter. 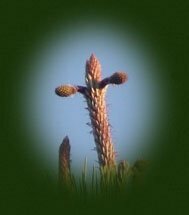 By the time Easter Sunday comes around, you will see that most of the Pine trees will have small yellow crosses on all of the tallest pine shoots." I turned to look out the window and I couldn't believe my eyes. It was a week before Easter, and you could see all of the pine trees with the tall yellow shoots stretching to Heaven.